It's about high time for an english entry, ain't it?? I've been writing like crazy these days! After all those months of nothing... How inconsistent could I possibly be? Funny thing, but I feel a bit diplomatic when I use english... with japanese my character goes the other direction... goofy! I think that's why it's more difficult to write silly english messages just for laughs (if you've ever read translations of my japanese messages, you know what I mean!). I was in NY last week, taking care of a couple of things, and I'm in Tokyo now. We've just begun doing preproduction (preparation) for my summer tour in Japan. The process is so f---ing different from writing/recording songs!!! It's pumping me up!!! I realized how much I needed this, after two years of back to back album recordings. Oh man. I am experiencing the worst jet-lag ever! I'm sorry that it's been a couple of weeks since the showcase already! (or has it been longer?) I hope it was as memorable an experience for the people who came to see it as it was for me. I'm happy that it made the kind of impression I had intended to make. It was great that I got to invite a bunch of my fans to the event and see them backstage after the show. Although we couldn't spend that much time backstage, it's pretty rare for me to have such close contact with fans (unless somebody notices me outside somewhere). It was really touching. Thanks again for coming... whether it was from nearby, or pretty darn faraway! They might have seemed out of sync with the American staff, but that's because they belong to two totally separate companies. Maybe it's also a cultural difference, because a lot of the observations seem to have come from American fans. If it weren't for them, the greetings after the show probably would've taken much longer and I might have kept my guests waiting very long. I just wanted to say that they're really nice, well meaning people (they're probably younger than you think they are) and I trust them a lot, so we're sorry if any of our mannerisms came across as rude or uptight! Wow that became so much longer than I'd planned! I just had to say this! I've never placed much importance on it, but this year my husband gave me red roses and a box of chocolates---very classic and very sweet. It might've been the first time I received a proper gift like that on valentine's day. Hey hey! That makes me sound like an unpopular gal... let me explain! In America, the general custom is for boys to give flowers or chocolates to girls, right? The funny thing is, in Japan, it is the complete opposite. Oh, a girl might prepare all sorts of things, home-made cookies, chocolates, even a hand-knitted sweater, and if she has a crush on someone, this is THE day to let him know. So... can I tell you what I've been up to these days? I've been rehearsing for my showcase. It's a whole lotta fun everyday. My band sometimes busts out with an 80's hit medley jam session (no, folks, it's not gonna be a part of the show!) and I get totally jealous that I don't know those old tunes. If I knew them I'd be jamming with those 30-something cats. Well, I'm learning, so maybe next time. Exactly one more week till the real thing. It's sounding better and better, and the visuals (which play an intimate role with the music) are starting to take shape. I've been blessed with some really cool creators (my husband's a part of the team) and I can already tell it's gonna look damn good. Let me know if you're interested in seeing my reading list. Umm, they're not all about salt. My fan base in Japan is a pretty cool mix of all different age groups---babies (I'm serious!) to grandparents and ladies and gents and everyone in-between. Come to think of it, I'm not sure of the demographic of my fans beyond Japan... so how old are you guys?? I just turned 22, last Wednesday. I woke up at 6 am, took a bath and did some yoga, took a shower, and went to the dentist... and had all 4 wisdom teeth pulled out. Ha! Betcha didn't see THAT comin'! There was a meeting that night I couldn't get out of, so I went downtown to the designated spot, and it turns out,,, to be a SURPRISE party! Well, it sure was successful... at SURPRISING me! I was secretly freaking out because even my record company execs were there, and there I was, tripping on painkillers and half dozing off! Yeah, rebel! No really. Other than that, a lot of people showed up for me and it was a very sweet party. I stayed as long as I could keep my eyes open. Holy crap I've been at this job for 7 years! Hey! 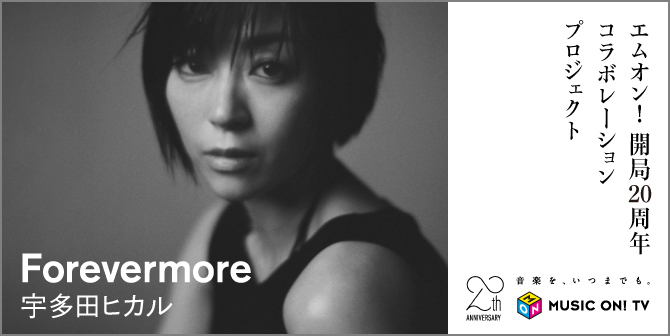 This is Utada, reporting to all english-speaking (or at least -reading) visitors of this website! First of all... my sincere apology for keeping some of you waiting for so many months. Thank you for not losing interest in a NEVER updated artist message page. Your words and patience have meant a lot to me. I've been criminally lazy about writing both Japanese and English messages for a while now, but I hereby declare my new year's resolution to keep hitting the "post new message" button in my brain. (What the hell kind o' crazy expression was that? I have to keep writing more so that you can get used to my cryptic ways... :) ) And for those of you who have just recently begun checking my website: dude, you got good timing! So. How are you? Wherever you are, I hope you are safe, and, at least while you're with me during these exchanges, not lonely. The year 2004 ended with the shocking news of the tsunami. While the immediate worldwide reaction/aid for the calamity is a positive indication of how much we can accomplish together, that people all over the world DO care, there are always going to be natural disasters and issues of humanity deserving just as much attention. Like many of you, I donate money whenever something catches my attention... but for a long time I've been trying to figure out how I can, or more importantly, how I WANT to, change the world---not just by donating large sums of money via organizations or by using my publicity, but in a more personal, powerful way. Well... I think I've found it! It's really just begun to BEGIN to begin, and it may take some time to materialize, but I just had to tell you about it now, because I am EXCITED. I don't even know yet how public I will make it, but you WILL hear news from me some day. This isn't work-related... just me as an individual. Merry Christmas, or Happy Hanukah, or just a Happy End-of-the-year-2003! I'd also like to say Happy Birthday to people whose birthdays happen to get all mixed up with this busy holiday season. I haven't written in english for ages!! I really need to apologize to those of you who had to wait for so long, and to everybody who kept reminding me to write, without giving up on this lazy girl! A lot has happened since the last english message, naturally, and... one of the high lights may be that I graduated high school. (Yes!!) It's such an incredulous concept to grasp that I am still having trouble understanding that I am no longer a high school student! Many days and nights were spent trying to envision my future and where each decision would take me. The same goes for everybody who graduated this year, I guess. This is a message for everybody who was involved in the recent earthquakes in Taiwan, Turkey, and Greece----for those who actually had to face the terror, and also for everyone whose loved ones were involved. A friend of mine was in Taiwan at the time of the earthquake, and I also receive many messages from Taiwanese fans through this site. Although my friend was safe, I know that many, many others were not as fortunate... Japan has had similar experiences with natural disasters, and I want you to know that all of us in Japan are praying for fast recoveries from the situations, both physically and mentally. I'm hoping we can do more than just send funds---I hope our feelings of support are reaching everybody too. Because there never may come a day of complete peace and happiness all over the world, let us help each other through difficult times. it's totally summer　and i'm loving every inch of it* ...you know what? every time i write something in english, i seem to be talking about the season... now that i think about it, summer might be my favorite one! (that's my excuse for talking so much about it!) i mean, you get a lot of opportunities during summer break to try new things and have a bit of adventure... (plus, i don't need to wake up so early every morning :] ) for me, summer is always the busiest and most fulfilling time of the year because while i'm off from school, i get to concentrate fully on indulging myself in music, and just having FUN!! it's really great that recently, a lot of these R&B artists come to japan to perform too.